Entrückungen spielen eine besondere Rolle in der Musik von Bon Iver. Das Abgelegene ist ein Thema. 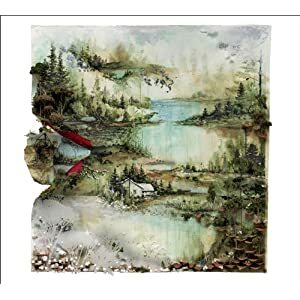 Die letzte Platte, die Justin Vernon bekannt machte, liefert gleich ihren eigenen Mythos mit: zurückgezogen wie einst Henry David Thoreau, verbrachte der Mann, der sich „Guter Winter“ nennt, lange Zeit in einer Blockhütte, krank und trauernd. Da entstanden die Lieder. Diese Platte wurde von Kritik und Publikum gleichermassen verehrt, ich konnte mich da nicht anschliessen. Auch auf der Mitte Juni erscheinenden neuen Arbeit (s. Cover) wird ein Rückzug angetreten – diesmal in die alte Heimat. Dort scheint meistens Winter zu sein. Und diese neue CD beeindruckt mich sehr. what I know, what it is, is pouring – wire it up! Dieser Beitrag wurde geschrieben am Donnerstag, 19. Mai 2011 und wurde abgelegt unter "Blog". Du kannst die Kommentare verfolgen mit RSS 2.0. Kommentare und Pings sind zur Zeit geschlossen. When Justin Vernon made his way out of a log cabin in Wisconsin with the recordings that would make For Emma, Forever Ago under his arm, he could little have thought that his collection of deeply personal, heartfelt songs would get him world recognition and a guest appearance on the latest record by the biggest rap star on the planet. Seems that Vernon is living proof that pouring effort and soul into a record often reaps reward. Anyone who moved on to his 2009 EP Blood Bank found sudden leaps in the Bon Iver sound – particularly the auto-tune experimentation of “Woods”, and many expected Vernon to throw himself further into futuristic production techniques, moving away from the bare bones basics that made his name. The genius of his new effort is that it marries these things not just effectively, but beautifully throughout this self titled record. This becomes apparent instantly, as the gorgeous Perth grows from a spine-tingling guitar line into something that manages to be heavy and delicate simultaneously. Military style drums drive the song to a surprisingly heavy climax, as chords crash and pound apocalyptically. It even recalls Explosions In The Sky in its crushing coda. There is a density to the songs here that his debut didn’t have – as brilliant as the songs on For Emma were, it would be intriguing to see what Vernon would do with them in a studio. This record delivers an idea of that, from the swirling, mesmeric arpeggios of “Holocene” to the laidback strumming of “Towers” with its lush horns augmenting the alt-country feel. Vernon’s lyrics remain abstract and cryptic throughout, littered with arcane terms and references to places, mainly in North America, that influenced Vernon’s writing. There is experimentation throughout, especially on the echoing electronics of “Hinnom, TX” as Vernon’s deep baritone is answered by his own pained falsetto. “Calgary” relies heavily on icy synths, building into a metronomic peak roughed up by fuzzy guitars. Last of all though, is “Beth/Rest”, which sounds genuinely like a Prince song circa “Purple Rain” – all big, epic drums and synth-heavy layers, shot through with squalls of lead guitar and saxophone. It is a striking, surprising conclusion to the album, and leaves you wanting to leap right back to the start again.